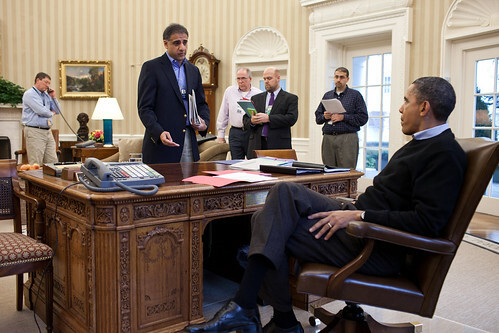 President Obama this week nominated top White House Iran advisor Puneet Talwar to be Assistant Secretary of State for Political Military Affairs, as the Back Channel reported in July was expected. The promotion for Talwar, who has served since 2009 as the National Security Council Senior Director for Iran, Iraq and the Persian Gulf affairs, would mark the latest departure of a key member of the U.S. Iran negotiating team as the U.S. prepares to resume P5+1 nuclear talks with the new Iranian Hassan Rouhani administration in the coming weeks, after a five month hiatus. Rob Malley, a former Clinton administration NSC Middle East advisor, is expected to join the NSC, succeeding Talwar after his confirmation, as the Back Channel previously reported was under consideration. The White House declined to comment. Malley didn’t respond to a query. But several sources suggested that Malley may not play the same role on Iran issues as Talwar, and that National Security Advisor Susan Rice would like to bring Malley to the White House to help rethink how the National Security Staff Middle East work is organized. Malley has already been informally advising the State Department on Syria from the outside, officials tell the Back Channel. Also expected to join the NSC as a director on Gulf affairs is Elisa Catalano, Rice’s former Iran/Gulf advisor at the U.S. mission to the United Nations in New York, and a former special assistant to Deputy Secretary of State Bill Burns. Sources said they were still uncertain who from the White House might be part of the U.S. delegation to the P5+1 talks with Iran, led by Under Secretary of State for Political Affairs Wendy Sherman. Talwar has accompanied Sherman as the +1 to most of the political directors meetings with the Europeans and P5+1 for the past few years. Former White House WMD coordinator Gary Samore, who left the administration early this year for Harvard, was also a key member of the U.S. delegation to both the P5+1 political and technical talks with Iran, along with former State Department Iran arms control envoy Robert Einhorn, who left the administration this summer for Brookings. Sherman has selected longtime State Department nonproliferation advisor Jim Timbie to be her top Iran arms control deputy, succeeding Einhorn, officials said. Beyond their formal functions, Talwar, Samore and Einhorn have served as key points of contact for informal consultations among the foreign diplomatic, arms control and Iran expert communities seeking to confer with the administration. American officials are preparing with their P5+1 counterparts to meet on the sidelines of the United Nations General Assembly in New York later this month to agree on arrangements for resuming nuclear talks with Iran. Western officials are still waiting to see what kind of response to the P5+1’s offer new Iranian President Hassan Rouhani and Foreign Minister Mohammad Javad Zarif may bring to the table, when nuclear talks finally resume. Iranian sources suggested this week that Iran might be willing to limit the number of its centrifuges, but not the quality of them; cap enrichment at 5%; accept a more intrusive IAEA inspection and safeguards regime; and sign the Additional Protocol, in return for significant sanctions relief, recognition of its legal right to enrich to 5%, and additional, unspecified incentives put forward by three European powers in a past proposal.